To be held at Cardiff University Main Building, 30th April 2018-1 May 2018. Cardiff University Special Collections and Archives, with generous support from the Collingwood and British Idealism Centre, is hosting a conference to celebrate the newly-catalogued Collingwood Archive and promote scholarship in Collingwood studies. Spanning 60 boxes and four generations, the Collingwood Archive is the family archive of a world-famous family of remarkable artists, archaeologists and writers. It has thousands of letters (including from John Ruskin, Arthur Ransome, E. M. Forster and Beatrix Potter), diaries, sketches, personal recipe books, photographs, illustrated story books and outstanding artwork including beautiful miniature portraits and stunning landscapes of the Lake District and Iceland. It is a new public treasure trove. The family’s diverse interests and experiences span art and art history, archaeology (especially the CWAAS), architecture, aviation, Icelandic studies, philosophy, Ransome studies, Ruskin studies, and many more. This celebratory conference will present varied papers from distinguished researchers to reflect this rich variety of topics. We will also launch our celebratory exhibition of treasures from the Archive, many available for public viewing for the first time. If you would like to attend, please contact the Collingwood Archivist, Judith Dray (drayjm@cardiff.ac.uk). John Ruskin is currently considered a "single author." If one or more works are by a distinct, homonymous authors, go ahead and split the author. 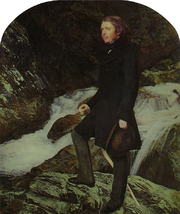 John Ruskin is composed of 10 names. You can examine and separate out names.